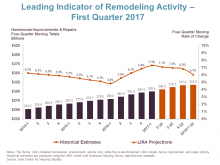 Strong gains in home remodeling and repair activity are expected to ease moving into next year, according to our latest Leading Indicator of Remodeling Activity (LIRA) released today. The LIRA projects that annual growth in home improvement and repair expenditure this year will remain above its long-term trend of 5 percent, but will decline steadily from 7.3 percent in the first quarter to 6.1 percent by the first quarter of 2018. Homeowners are continuing to spend more on improvements as house prices strengthen in most parts of the country. Yet, recent slowdowns in home sales activity and remodeling permitting suggests improvement spending gains will lose some steam over the course of the year. The remodeling market is approaching a cyclical slowdown after several years of steady recovery. While the rate of growth is starting to trend down, national remodeling expenditures by homeowners are projected to reach almost $320 billion by early next year.